The American Eskimo Dog is registered with the United Kennel Club and on July 1st, 1995 was accepted into the non-sporting group of the American Kennel Club becoming the AKC's 138th breed. White is the preferred color, although biscuit or cream markings are acceptable. 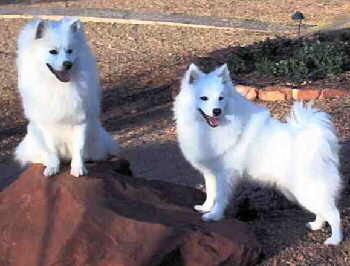 The American Eskimo is a bright, alert, intelligent dog that is perfectly willing to guard his family when necessary.